These dolls have survived since the early 70s, making them all 44 years old. That’s a long time for a plastic child’s toy to survive. Many of these dolls have endured time as a child’s plaything, then being stuffed away in attics and in other places in less than ideal conditions. Each Kenner is amazingly different, despite their common and very similar beginnings in a toy factory. Each Kenner has their own quirks, and that makes them very unique. Some of them have seen trauma through their time – either from children or just the elements, while others have been lovingly cared for as a favourite childhood toy of the past. All of my Kenners have their own quirks, but they’re all still beautiful to me. My favourite Kenner quirk is one of Prim’s. She has a far left eye lash for each eye that always gets stuck inside of her face plate because they’ve been bent, and if they’re out they stick out in a way that points away from the rest of the eyelashes. If it was one of my Neos, this would bug me, but for her it’s endearing – I could not tell you why. 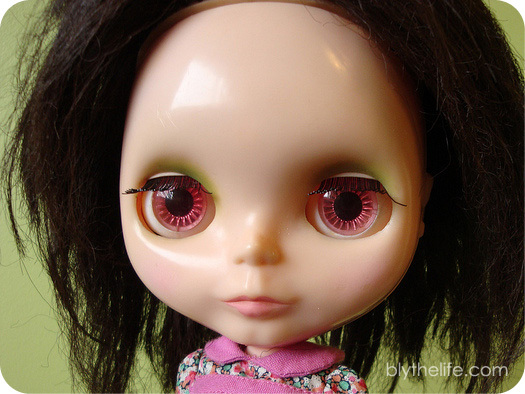 Do you own any Kenner Blythes? What are some of their endearing quirks? I have a few Kenners and they are all unique. Their quirks are the best parts of them.